or perhaps the edge of the knowledge that the investigation seeks. We can read this breakdown in the confidence of the line a few different ways, not only as speed bumps for the reader, but as a reference to the sense of loss that pervades Meridian, as a reference to the necessary in-between-ness of what a meridian is, breaking even solid units into smaller pieces. “Conclusion” very nearly brings the poems’ divergent trends together. At a mere six lines, it’s one of the shortest, with its two standout lines right-aligned: “nothing ever ends / ... may arrows split each other.” The first alludes to the continuous stream of time, stretching the main poem’s length like a geometric ray past an artificial horizon; the second brings us back to division, split, meridian. We speak of time as having an arrow, and here Gibson wants two arrows (ostensibly flying in opposite directions) not to pulverize each other, or strike a target, but to split each other. What happens when the arrows split? As the last line, Gibson leaves us to imagine both why they ought to split and how it will change the world to split arrows in flight. I like to think that they continue, that the split is fractal, that one can further subdivide the splits. Perhaps this is Gibson admitting defeat, the failure of his investigation, or maybe he is trying to show us a different kind of answer. “Nothing ever ends...” is a clear assertion that the conclusion is inconclusive. In a way, this is a deeply unsatisfying final poem, a sort of cop-out (paradoxes are easy) but it inspires the confidence to re-read, to re-consider, and has won at least that much from me as a reader. 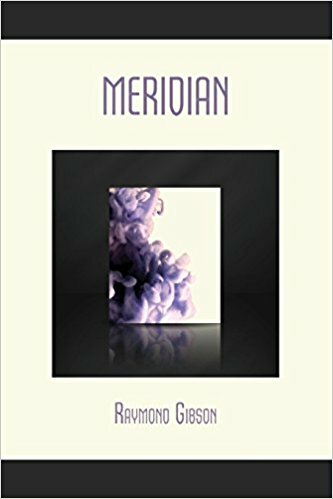 Ultimately, Meridian is a satisfying read that delivers on more than its basic conceit (a long poem divided by short poems). This is a solid effort with tight construction, obvious feeling, and an effective transference of personal experience to the reader. Though rough in a few spots, Gibson demonstrates a keen sense for the organization of book-length work; in circling around the center of his book he appears to break the central premise of its title but perhaps contributes a different understanding of division and substance. B.C.A. Belcastro is an emerging poet, critic, and political organizer; he lives with friends in New York City.